If you’ve been under a rock or down on the farm for the last few hours, you might have missed out on Metal Gear Solid creator Hideo Kojima showing up at Sony’s E3 2016 press conference this year. It’s true! He brought out his new game Death Stranding, which stars Norman Reedus in his best birthday suit, and what’s most euphoric about the whole situation is that Konami is nowhere to be seen. Kojima and Reedus had originally teamed up for Silent Hills, but Konami ended up pulling the plug on the project. Instead, the two parted the company with the bitterest of bitters and decided to team up on their own. It still seems that the duo still has a few grudges after this Instagram photo popped up on Reedus’ account, but all of those bitters have been replace with salt. Pure, delicious salt. Oh, will this drama ever end? 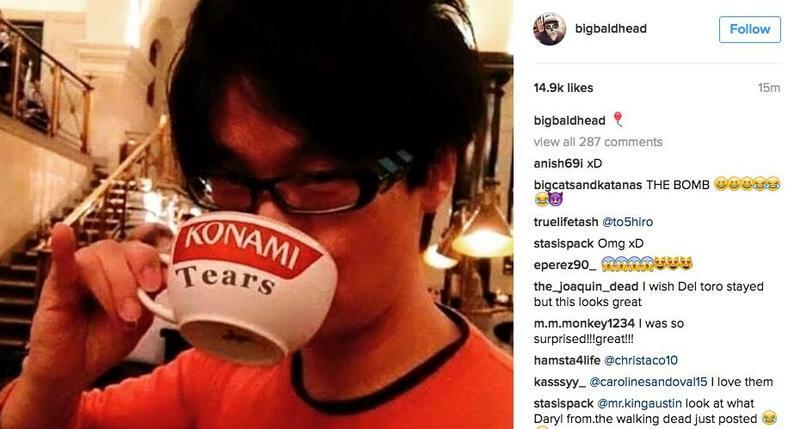 My guess is that Konami is crying tears of relief, hardly heartbroken to see Kojima move onto Sony. It no longer has to keep around this big-headed budget-ignoring auteur, and even better, his entitled gamer fanbase are but figures in their rear-view mirror, outside of the occasional pot-shot… which they could care less about. Hey, hate to break it to you, but the executives of a pachinko, gym, and health-spa company don’t care what a bunch of gamers think. The only groups who are probably feeling the sting are the North American and Japanese PR teams, who just woke up one morning no longer with a cozy position in the video game industry. Gamers, fans, everyday guys and girls who thought they had it made at their favorite childhood company and are now forced to spin the worst gaming fallout in history while enduring the ruthless, tactless taunts of gamers about naked Norman Reedus. Sorry to point that out to you, but just remember, these are the innocent workers who feel your burns, not the executives sitting on gold thrones in the ivory towers of Tokyo. Think about that before the next time you crack a joke at Konami’s expense. Be sure to check out the trailer for Death Stranding, and join the rest of the world as we witness Kojima’s post-Konami career evolve right before our eyes.